As far as we know, Edna Wemple participated in only one collecting expedition to Shasta County; since there is a Shasta County fossil locality in the UCMP database called Camp Wemple (-1007), it is safe to assume that the locality “bore fruit” in 1903 when Edna was present. Specimens of Shastasaurus and a skull fragment of Thalattosaurus were recovered there. A photograph of F.S. 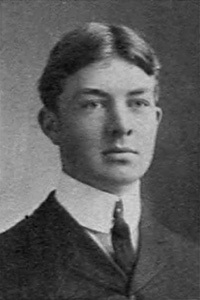 Ray from the University of California’s 1904 Blue and Gold yearbook. Frederick was born December 18, 1882, in Riverside, California, to Walter Selden Ray of Iowa and Eva Ferris of Illinois. Ray graduated from UC Berkeley in 1904 with a degree in Nutritional Sciences. While at Berkeley, Ray served in the Military Department, was a member of the Psi Upsilon fraternity, and as a senior, served as vice president of the Harvey Biological Club (Malcolm Goddard, a participant in the Saurian Expedition of 1905 was a sophomore member at that time). After graduating, Ray moved to Maryland to attend Johns Hopkins Medical School. He graduated in 1908, received his doctor’s certification in 1911, and set up a practice in Los Angeles as a general practitioner. Ward was born October 7, 1883, in Ottawa, Kansas, to Calvin Esterly (1852-1921) of Ohio and Alice M. Olin (1855-1912) of New York. He had at least one sibling, Calvin Esterly Jr.
During most of his student days at UC Berkeley, Esterly lived at 2350 Ellsworth Avenue on the south side of campus. Like Frederick Ray, Ward was also a member of the Psi Upsilon fraternity and served in the Military Department. He was one of four First Violins in the UC Orchestra and served as secretary and treasurer of the organization for a time. During his junior or senior year he was a Social Chairman at the YMCA. After college Esterly became a building contractor and a member of the Masons. He managed the Esterly Construction Company whose offices were at 2136 Center Street in Berkeley. Participant list from Hilton, page 140. Edna Wemple’s Masters thesis was Wemple, E.M. 1906. New Cestraciont Teeth from the West-American Triassic. University of California Publications, Bulletin of the Department of Geology 5(4):71-73. Jordan’s quote from Jordan, D.S. 1910. The Fossil Fishes of California with Supplementary Notes on Other Species of Extinct Fishes. University of California Publications, Bulletin of the Department of Geology 5(7):95-144. Family and other information from sources accessed on ancestry.com.